The essence of all Buddhist teachings is to arrive at lasting peace and happiness through transforming the mind. Rigpa offers courses and events that can help us face the challenges and big questions in life, as well as an in-depth curriculum of study, reflection, practice and retreat based on the graduated stages of the Buddhist path of awakening. 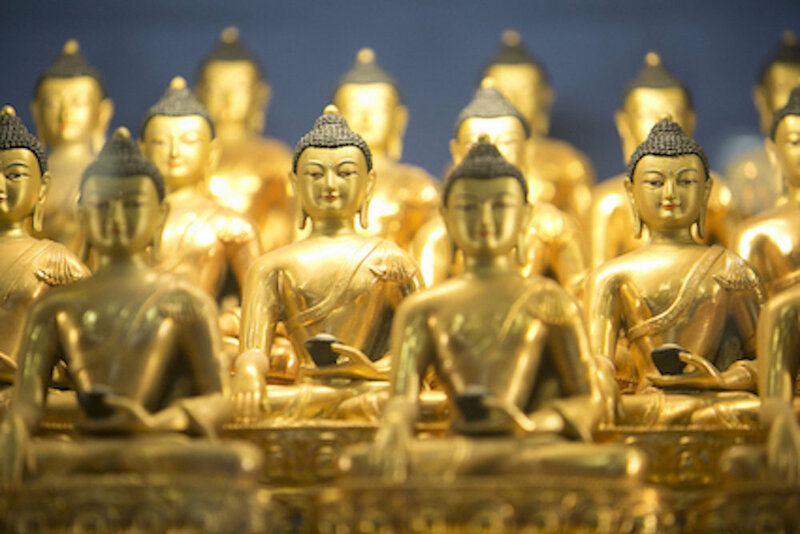 Courses and events offered in Rigpa form part of an in-depth curriculum of study, reflection, practice and retreat based on the graduated stages of the Buddhist path of awakening. The general approach shared in Rigpa is that of Tibetan Buddhism, which brings together all three historical vehicles of Buddhism: the Basic Yana, the Mahayana and the Vajrayana (see Glossary of Terms below). In particular, Rigpa follows the Nyingma lineage and tradition of Dzogchen, or “Great Perfection”—the most ancient and direct stream of wisdom within the Buddhist tradition of Tibet, which reveals the way to realize the innermost nature of mind and can be considered as the zenith of all yanas. The essence of all Buddhist teachings is to arrive at lasting peace and happiness through transforming the mind. The Buddha taught the importance of recognizing the reality of suffering, abandoning its causes and achieving liberation by following the path. In general, the Buddhist path is very flexible. Buddha was renowned for teaching a wide variety of ways to practise, each attuned to the needs of different individuals. At all stages of the path, one can study and practise in great depth, or in a more essential way, the key point being the transformation that actually takes place in one’s being. Foundations of the Path is not only for beginners, but also for all Buddhist students, wherever they are on the path. Share the key principles and practices of meditation, compassion and wisdom with all those simply interested in Buddhism. There is no notion of having to become a Buddhist at this point; you can simply use what you find relevant to face the challenges and big questions of life. Provide a solid foundation in the key philosophical principles of Buddhism, especially those of the Basic yana, so that one has a stable and solid foundation for the later stages of the path. This category of courses and events is based on the ‘Great Vehicle’ (Mahayana) of Buddhism and starts to explore the central practice of bodhichitta—the altruistic wish to attain enlightenment for the sake of all beings. This approach entails training in love and compassion to the fullest extent as well as developing profound insight into the ultimate nature of reality, or shunyata. These teachings and practices can be of great practical value to anybody, regardless of whether they wish to be Buddhist or not, but they also form the heart of formally following the Buddhist path. For those who wish, the Refuge and Bodhisattva vows can be taken at this stage. Doing so marks the formal entry point to the Buddhist path and to the Mahahaya. The Vajrayana path is a specialized path of the Mahayana that is suitable for certain individuals. This path requires students to have formally entered the Buddhist path by taking Refuge and Bodhisattva vows, and to have a solid foundation and experience of the principles and practices of the Mahayana. Vajrayana practices emphasize the close guidance of a qualified teacher and employ many special methods such as visualization, mantra recitation and profound meditation, in order to arrive swiftly at a direct realization of one’s true nature and the nature of reality itself. As the foundation for the Vajrayana, the preliminary practices, or ngöndro in Tibetan, have been skilfully designed to effect deep transformation at every level of our being. Not only do they prepare the practitioner for the profound practices of Vajrayana and Dzogchen, but they also form a complete path to enlightenment. Having studied and practised the preliminaries to some extent, one can formally enter the Vajrayana by receiving an empowerment from a qualified master, which enables one to study the Vajrayana teachings, or tantras, and engage in Vajrayana practices, or sadhanas. Rigpa upholds a vibrant lineage of transmission and practice of many powerful Vajrayana rituals, including those of closed individual and group retreats, drupchös and drupchens. Though generally associated with the Nyingma or Ancient School of Tibetan Buddhism founded by Padmasambhava, Dzogchen has been practised throughout the centuries by masters of all the different schools of Tibet as their innermost practice. Dzogchen is considered to be the pinnacle of the Vajrayana teachings, and formal Dzogchen practice is intended for those who have accomplished the Vajrayana preliminaries and have accepted the guidance of a qualified Dzogchen master. In Rigpa, the spirit and view of Dzogchen is shared throughout all the stages and practices of the path, even in the practice of meditation. This is reflected in the teachings from many different masters who visit Rigpa annually. • Basic Yana: the ‘vehicle’ (Skt. yana) of teachings and practices based on the Buddha’s first turning of the wheel of Dharma which develops the four truths of the noble ones and is contained in the corpus of early Buddhist texts. It emphasizes the path of individual liberation rather than that of the bodhisattva. • Bodhichitta (Skt. ): the compassionate wish to attain enlightenment for the benefit of all beings. • Bodhisattva (Skt. ): someone who has aroused bodhichitta. • Drupchen (Tib. ): literally ‘vast accomplishment,’ drupchen is a form of intensive group practice that epito­mizes the depth, power, and precision of the Vajrayana, drawing together the entire range of its skilful methods. This practice continues day and night without any pause for at least eight days. • Drupchö (Tib. ): an elaborate way of practising a particular sadhana in a group over several days. • Dzogchen (Tib. ): ‘Great Perfection’, or ‘Great Completeness’. The practice of Dzogchen is the most ancient and direct stream of wisdom within the Buddhist tradition of Tibet. It is one of the clearest and most effective ways of realising the innermost nature of mind. • Lojong (Tib. ): literally ‘training’ or ‘transforming the mind’. These teachings emphasize mostly the practice and application of bodhichitta. • Mahayana (Skt. ): the ‘Great’ or ‘Universal Vehicle’. The essence of the Mahayana is the aspiration to attain buddhahood as the only means of helping all beings to find complete liberation from suffering. • Ngöndro (Tib. ): the ‘preliminary’ or ‘foundation’ practices of Vajrayana Buddhism. • Sadhana (Skt. ): literally ‘means of accomplishment’. A sadhana is a ritual text presenting the means to accomplish one or several deities, who in essence are the ultimate state of a buddha. • Sangha (Skt. ): the community of practitioners who follow the Buddha’s teachings. • Trekchö and Tögal (Tib. ): the two main practices of Dzogchen. • Tsa Sum (Tib. ): the ‘Three Roots’. In the Nyingma tradition, once the ngöndro is accomplished, practitioners continue with the sadhanas of the Three Roots, the inner refuge of the Secret Mantrayana. They are like the root or the basis for all the positive accumulations until the attainment of enlightenment. • Vajrayana (Skt. ): ‘Vajra Vehicle’. Based on the motivation of bodhichitta, the Vajrayana is a path centred on cultivating pure perception.